The Audi Q5 comes powered by a choice of inline-4 and V6 turbo engines driving all wheels. The Q5 features a well-built cabin and sporty handling. 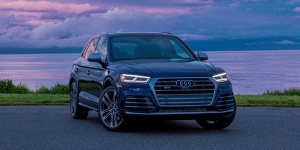 For 2019, the Audi Q5 adds further standard equipment. All models now feature heated front seats, Audi Connect CARE, a 7-inch infotainment driver display, and roof rails, while Premium Plus models also include Audi MMI Navigation plus with MMI all-in-touch, rear seat USB ports and wireless phone charging. The SQ5 now comes in a base Premium trim level that adds LED lights and heated 8-way power front seats on top of the normal Q5's equipment. An updated Convenience package features Audi side assist and rear collision warning. Get the best price for the Audi Q5 of your choice from a dealer in your area. Request a price quote now.